An off-duty police officer has been stabbed during an attempted car-jacking. 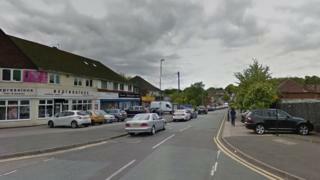 The West Mercia officer, in his 20s, was in Moreton Avenue, Great Barr, Walsall, at about 13:30 BST when he was approached by a man demanding his car keys. He was then stabbed in the chest but his injuries are not believed to be life-threatening or life-changing. West Midlands Police is appealing for people with information. The force said the offender made off from the scene in a dark blue Ford Fiesta. West Mercia Police said it was aware of the incident and supporting the officer and his family. Witness Sandy Dhanda said she heard a car "screech" to a halt and reverse before pulling up in the middle of the road. "A young guy with a scarf over his face ran over shouting 'give me the car key'," she said. "All of a sudden I saw a white tissue or something and he was doing a stabbing motion towards him. "I couldn't believe it was happening. I'm just so shocked, we all are." The victim is believed to have made his way over to a nearby estate agents, where staff raised the alarm.